I can’t believe I have been blogging for 1 year! 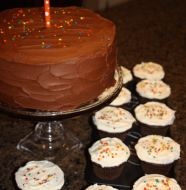 Happy Blogiversary to us! I originally started this blog as a way to share recipes and as a way to help me cope with the fact that my youngest was starting kindergarten. I now have one in 3rd grade and my “baby” is in 1st grade. I never imagined how much I would enjoy blogging. I love sharing recipes and have really enjoyed getting to know many of you through your comments. I love hearing from my readers!!!! Just for kicks, I thought it would be fun to share some of the statistics about dinahs-dishes.com. In our fist year, we have had over 40,000 page views, over 7,000 visitors who visited the site almost 19,000 times. We’ve had 158 posts, 530 comments and the readers have come from 85 different countries. I hope you don’t mind me sharing. I thought it was really cool that something I’ve enjoyed doing has been enjoyed by so many others. My blog has become more than I ever imagined. It is a good outlet and a good discipline for me. It is easy to go from one thing to the next as a busy mother and never take time for ourselves (what my friend calls a “me moment”). I have been guilty of not taking time for myself way to often in the past, but I have found that writing my posts each week has given me a “me moment” and an outlet to share with others. It also has helped me realize how important it is for each of us to take the time so we can recharge. Obviously that means different things for different people. What does your “me moment” look like? Is it time spent reading, checking out blogs, exercising, or knitting? I think “me moments” are whatever gives you the energy to keep going. All I know is that being a mother and staying sane demands at least occasional breaks. I actually hope that somehow my little blog can help inspire and give you a “me moment” as well. To help us celebrate taking time for ourselves as mothers and to celebrate the anniversary of the blog, one of my friends has offered to giveaway one of her awesome shirts. She is a mother of three girls and knows all to well what it is like to long for a “me moment.” She has designed t-shirts that help remind and celebrate the me moments we long for as we go through our crazy/hectic days. 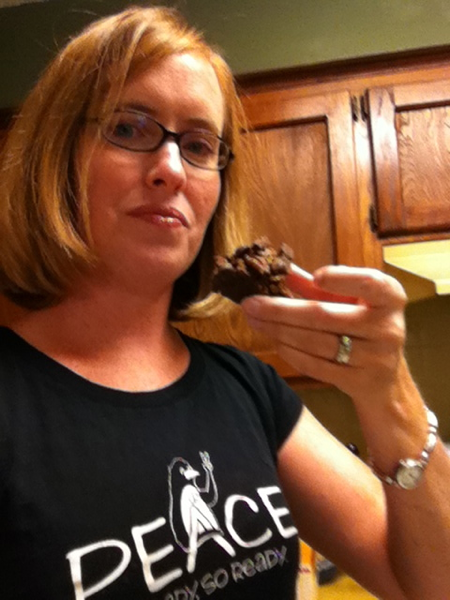 I have the Peace shirt and LOVE it! I can’t wait for the lucky winner to receive the shirt of their choice. I know you will love her shirts as much as I do. To enter for a chance to win a Ready, So Ready shirt you need to leave a comment on my blog telling me your favorite post/recipe over the past year, and which shirt you would pick from So Ready Designs. To receive a second entry repost a link either on facebook or twitter letting others know about the giveaway and leave a separate comment telling me how you shared the blog/giveaway. Entries will be accepted through Wednesday, August 24th and the winner will be announced on Friday, August 26th!!! Good Luck! Preheat the oven to 350˚ F. Line a 9×13-inch baking pan with foil and grease the foil well with butter or cooking spray. Combine the butter and chocolate in a heatproof bowl. Microwave in 30 second intervals, stirring in between, until completely melted and smooth. (Alternatively, set bowl over a pan of simmering water and heat, stirring occasionally until completely melted and smooth.) Once the butter and chocolate have melted whisk in the sugar, eggs and vanilla until incorporated. Stir in the flour and salt just until combined. Spread about half of the brownie batter in the bottom of the prepared pan in an even layer. Bake for 20 minutes. Remove from the oven, maintaining the oven temperature, and let cool for 20 minutes. Meanwhile, toast the chopped pecans until light golden brown and fragrant in a skillet over medium heat. Remove from the heat and set aside. 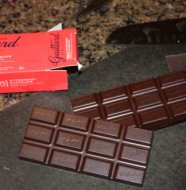 To make the caramel filling, combine the caramel candies and cream in a medium saucepan over medium-low heat. Heat, stirring frequently, until melted and smooth. Stir in half of the pecans. Immediately spread the caramel mixture over the bottom brownie layer. Lift the brownies from the pan using the edges of the foil. Remove the foil and cut the brownies into individual squares. Store in an airtight container. *If you don’t want pecans in all of the brownies just sprinkle pecans on half of the cooked bottom layer before adding the caramel and then only top that side of the brownies with the pecan garnish on top or omit pecans altogether and enjoy caramel brownies. 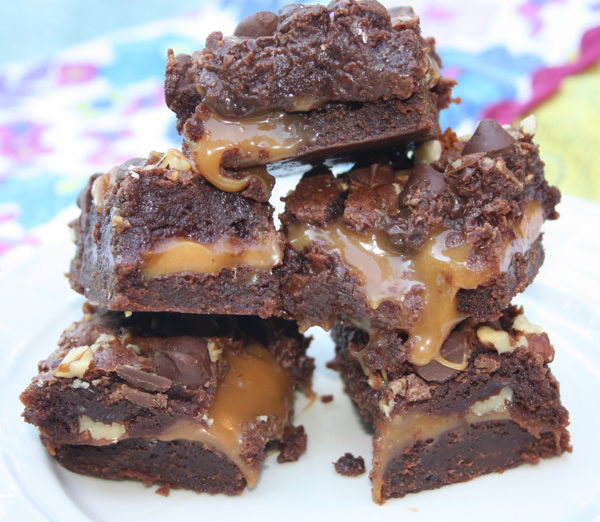 19 Comments on "Turtle Brownies and a Giveaway"
The turtle brownies sound AWESOME! hey, I love reading these. I can not wait to try some more. I really need to use the pumpkin from my freezer and and going to do the pumpkin pie crunch. Also gonna try the double chocolate zucchini bread, since the kids are in school and i can get more done!! I have enjoyed your blog and especially love what you share about yourself and your family. I have enjoyed trying several of your recipes and it would be difficult to choose a favorite. If I had to choose, I might pick the Creme Brulee Overnight French Toast. I prepared and served it at a brunch we had at work and it was a BIG hit! But my favorite post was the one (I don’t remember when) where you shared something about your catering business and you said that a man had proposed to you because of your cinnamon rolls. Well, I am single and I make cinnamon rolls, so I was excited…however, I have made these rolls several times before and since and no such offers…I’m trying to figure out what I am doing wrong… 🙂 I’m just teasing, but it did make me laugh. I agree with Marilyn as I requested French Toast…it was delicious. Also LOVED the White Chili last fall. The Raspberry Muffins were great too. Thanks for inspiring me to think outside the box and giving us new, yummy suggestions. I would make my shirt–CHOCOLATE!! Congratulations on your one year anniversary! I love all the recipies you share. Also, I shared the link on facebook, and hopefully some of my friends will check out all the yummies!! Love reading your blog and trying the recipes. Our family favorite is “Aunt Becky’s” Mexican Dinner. It’s a guilty-Friday-night-after-a-long-week pleasure with Frito chips! I enjoy fixing something fun for my boys after a week of school/activities, and this is a go-to recipe. Of course, I have to follow it up with something chocolate…so, I’ll have to incorporate these brownies the next time! And, I love the coffee shirt 😉 Happy blogging anniversary! Dinah, I have so enjoyed your blog and I am so glad you thought to share it with me. Since I am more about reading the recipes and the comments about your family and not so much about actually making any of them, I would have to say my favorites are the ones I remember your mom making. I still miss her so! I think the Coffee T-shirt says more about me! Dinah – love your blog my friend! Happy Blogiversary! My favorite recipe has been the pumpkin granola bars and the chocolate scones. But all I’ve tried have been great. Grant’s birthday coming up and I’m going to make the snickerdoodle cupcakes (his favorite cookie – I can’t wait!). I would pick the chocolate shirt 🙂 that’s my me moment! I gave you a lil’ shout out on f/b too! My favorite is still the Jerk Pork Tenderloin. It’s the first one I tried from your blog and we love it! I would choose the Coffee Tshirt. Happy Blogiversary!! It has been so much fun reading, cooking and eating these recipes over the past year! Our family’s favorite has been the Easy Chicken Tacos. 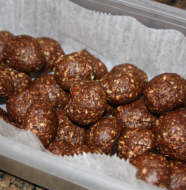 We have them at least once every two weeks, once they made it onto our table they have stayed in our regular rotation because they are so easy and so delicious! If I had to pick a favorite sweet recipe it would definitely be the Hepburn Brownies (even though I haven’t cooked them yet, I did eat them) 🙂 I would pick the Weekend T-shirt! Congratulations on your Blogiversary! You are amazing!! I have enjoyed getting to know you thru your wonderful Blog and recipes. Also, Ashley keeps me up-to-date about what’s going on with you. 🙂 She just adores you. My favorite recipe of yours is the New York City Chocolate Chip Cookies. Oh my goodness, they are the best! I think in honor of those delicious cookies, I would choose the “Chocolate” t-shirt. Ok, I am in love with many of your recipes!! But the Poppyseed Chicken is totally awesome!! For dessert that Chocolate Zuchini Bread is amazing, ok, so its not “dessert” but I love it and it feels like dessert!! I love the Chocolate t-shirt!! Those are cute shhirts! I think I did my facebook post right, but there are no garauntees!